Hello everyone! I have good news for you. Exciting offers are up for grabs! 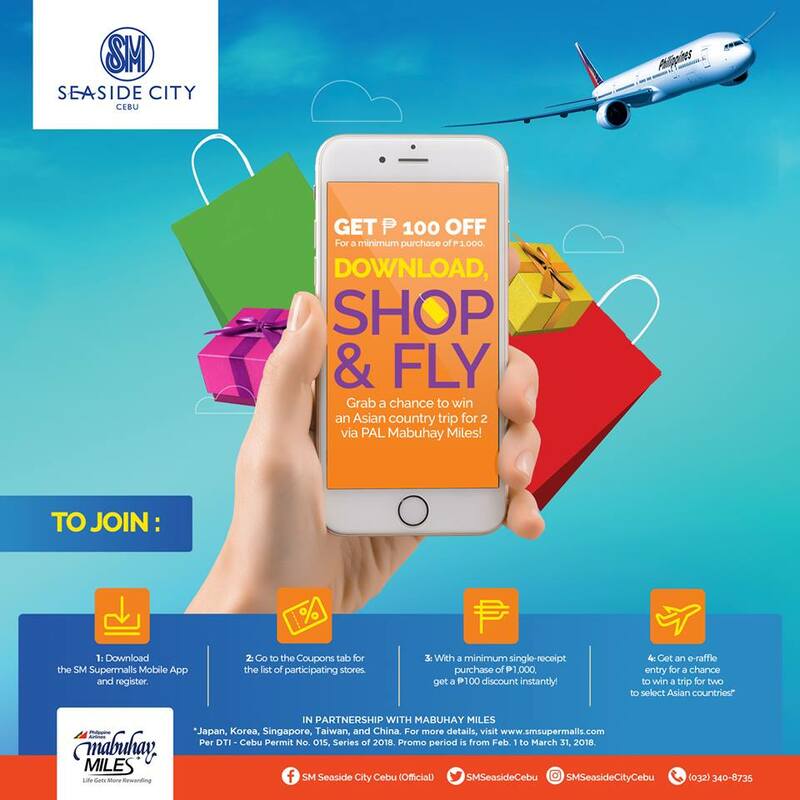 Cebuanos can now have a chance to turn their travel plans into a reality when they join SM’s latest promo in Cebu – SM Seaside City Cebu DOWNLOAD, SHOP & FLY – as SM continues to offer new and exciting ways to make shopping more fun and rewarding! From February 1 to March 31, mallgoers can avail an instant P100 discount from participating brands and a chance to win a trip for 2 to one of five Asian destinations, like Japan South Korea, Singapore, Taiwan, or China. Step 1: Download the SM Supermalls Mobile App and register. Step 2: Click on the Coupons Tab to see the list of participating brands. Step 3: With a minimum single receipt purchase of P1,000, get a P100 discount instantly! Step 4: Redeemed e-coupon becomes the e-raffle entry for the Asian country trip for two. In partnership with Philippine Airlines and PAL Mabuhay Miles, winners will also be getting additional mileage points when they fly via this promo. Over 250,000 Filipinos have subscribed to the SM Supermalls Mobile App because of chances like this. Download it now to get yours! Visit www.smsupermalls.com for more details. 1. What is DOWNLOAD, SHOP & FLY? Download, Shop & Fly is an in-app digital couponing campaign that rewards SM Supermalls mobile app users instant P100 discount from participating brands and a chance to win a trip for 2 to one of five Asian destinations: JAPAN, SOUTH KOREA, SINGAPORE, TAIWAN, or CHINA, starting February 1-March 31, 2018. 2. How do I download the SM Supermalls mobile app? User has to go either On the App Store or Google Play Store and search for “SM Supermalls” and install. The SM Supermalls mobile app is compatible to at least Jellybean and iOS 7 devices only. 3. How do I participate in DOWNLOAD, SHOP & FLY promo? User needs a strong and stable internet connection when using the mobile app. Digital coupons will be automatically be available every time the user logs on to the SM Supermalls app. Simply tap the digital coupon in the Coupons Tab to see the list of SM Seaside City Cebu’s participating brands. Each coupon offers P100 discount instantly with a minimum single receipt purchase of P1,000. Every redeemed coupon becomes an e-raffle entry for the Asian country trip for two. 4. How many times can I claim the coupons? Each coupon can only be claimed once during the whole promo duration. 5. Who are qualified to join this promo? All registrants of the SM Supermalls mobile app. 6. Can I avail the Download, Shop & Fly coupons in other SM malls? Promo is valid for SM SEASIDE CITY CEBU mall only. 7. How will I know if the promo is still ongoing and valid? The coupons will be labeled as promo ended and will not be redeemable any more. 8. Until when may I join and claim my prize? The Download, Shop & Fly promo runs from February 1 until March 31, 2018 only. 9. How will I know if I win the e-raffle for a trip for two to the following Asian destinations: Japan, South Korea, Singapore, Taiwan and China? Winners will be notified via registered email and mobile phone. The list of winners will also be posted on SM Seaside City Cebu’s official social media accounts and mall posters. 11. If I didn’t win the raffle in the first draw, can I still win in the succeeding draws? Customers’ e-raffle entries not drawn will still be valid across all draws. 12. Is the prize convertible to cash? 13. Who do I contact for more information and other concerns? Call at (02) 876-1111 or email us at customercare@smsupermalls.com. Thanks for checking Emelie Empire. This is a Lifestyle and Technology blog of an IT girl who wishes all the best for herself and the people around her. Read on and excuse the awesomeness! Eat All You Can: KOGI-Q Luto-Luto Ta! Journal 1: Thank you 2018!